Everyone wants lower A/C bills, especially during the warmer months in the stifling heat of the Gulf South. Radiant barrier insulation effectively reduces energy bills in these warmer months because its foil surface reflects radiant (invisible) heat from the sun, shielding homes and increasing the performance of any structure’s existing insulation. Radiant barriers reflect 97% of radiant heat and can be installed in residential attics, garages, and in an infinite number of commercial applications. Diversified Energy’s experienced contractors can put almost any building ‘in the shade’ with our premium heavyweight radiant barrier professional installations. Generally speaking, homeowners can expect to realize a 5% to 25% savings in their heating and cooling costs, with one-story homes experiencing the highest percentage of energy savings. Does DE Promise Drastic Results? After installing a radiant barrier, air conditioning units have less heat to remove, so they use less energy and run more efficiently. On a 75-degree day, radiant barriers may keep A/C units from running at all. Remember, reflective foil insulation (radiant barrier) is like shade, so more coverage equals more savings. Which Type of Radiant Barrier Insulation is Best? A radiant barrier foil product will work much better than radiant barrier paint, ceramic paint additive, or micro-spheres. 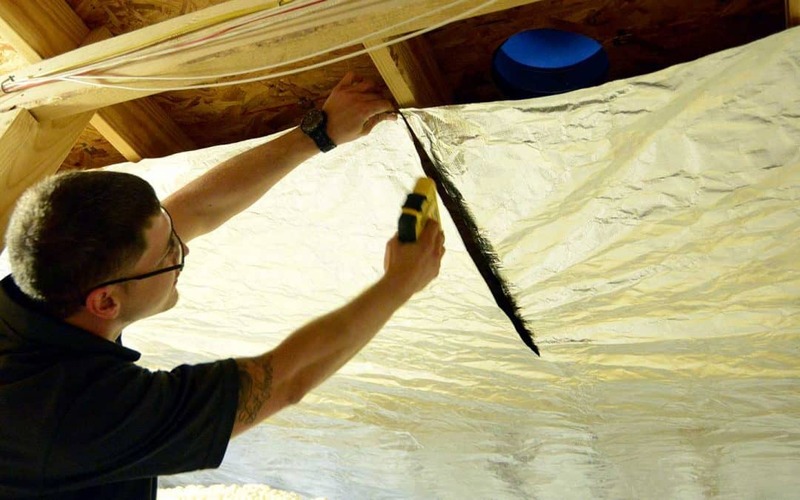 Sheets of foil are more practical, economical, and effective than shredded pieces of aluminum, such as radiant barrier chips, because they fully cover the space while allowing access to your attic, if needed.